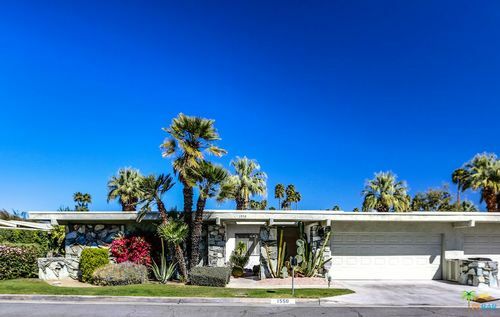 Impeccable South Palm Springs Canyon Estates home by mid-century architect Charles DuBois with clerestory windows and mountain views on fee land. This 2593 sq. ft. home has an open floor plan with a wall of glass the full length of the living and dining areas opening to a private covered patio; classic wet-bar; an updated kitchen with Kitchen Aid appliances including a gas range, double ovens, and refrigerator. The baths are in pristine original condition with a master en-suite bath with a luxurious tub, separate shower, dual sinks, make-up vanity and walk-in closet. 2nd bath has an outside door for pool to shower access. All rooms are over-sized with ample closets and cabinets. The HOA includes a private 9-hole golf course, 15 pools, 12 spas, 2 tennis courts, club house, fitness center, cable-tv, and earthquake insurance. Minutes to Smoke Tree shopping, restaurants, and hiking trails.